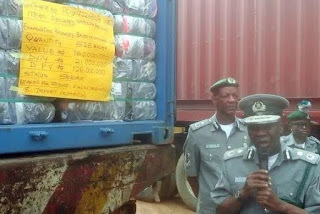 The Nigeria Customs Command in Lagos have confirmed the arrest of an Iveco truck carrying 498 cartons of Codeine Cough Syrup of 100 milligrams worth N199.2 million. The consignment, which was manufactured in the United Kingdom and had 200 bottles in each carton, was intercepted along the Ijebu Ode-Ore road last week. According to the controller, Federal Operations Unit, Zone A, Lagos, Mohammed Uba, two suspects had been arrested and detained in a Customs cell in connection to the seizure. “You will recall that the federal government banned any importation of cough syrup that contains codeine,” said Mr Uba. For the month of July, the Unit revealed that it had detained 21 exotic vehicles with duty paid value of N484,458,778. Some were intercepted along the Ijebu Ode expressway while 10 were evacuated from Oluwalogbon Motors at 164 Awolowo Way in Ikeja “based on credible information,” Uba said. Among the seizures were 9,504 bags of 50 kilogramme foreign parboiled rice, 436 jerrycans of vegetable oil, 333 cartons of frozen poultry products, and 287 bales of used clothing. The agency said ten suspects had been arrested in connection to the seizures. “Some have been released on administration bail while some are still our custody,” Uba said. A total sum of N1,120,714,338 had been recovered as revenue from 141 seizures made for the month under review, he added.